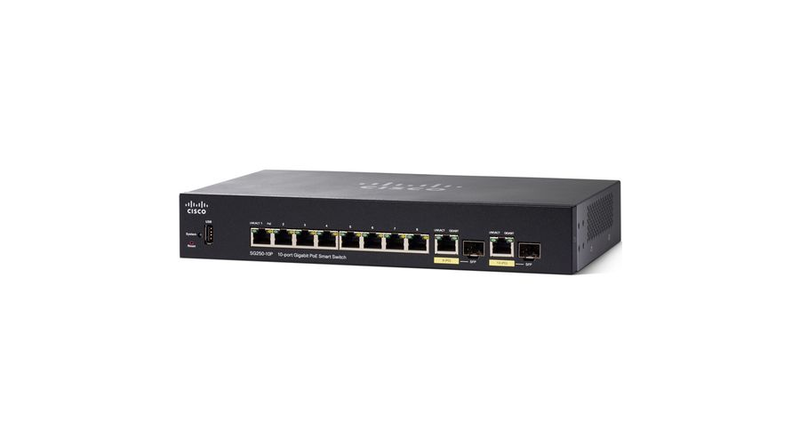 The Cisco 250 Series is the next generation of affordable smart switches that combine powerful network performance and reliability with a complete suite of the network features you need for a solid business network. These powerful Fast Ethernet or Gigabit Ethernet switches, with Gigabit or 10 Gigabit Ethernet uplinks, provide multiple management options, sophisticated security capabilities, fine-tuned Quality-of-Service (QoS) and Layer 3 static routing features far beyond those of an unmanaged or consumer-grade switch, at a lower cost than for fully managed switches. And with an easy-to-use web user interface, Smart Network Application, and Power over Ethernet Plus (PoE+) capability, you can deploy and configure a complete business network in minutes. This capability allows you to segment your network into separate workgroups and communicate across VLANs without degrading application performance. As a result, you can manage internal routing with your switches and dedicate your router to external traffic and security, helping your network run more efficiently. Cisco 250 Series switches are available with PoE+ on both Fast Ethernet and Gigabit Ethernet models. This capability simplifies the deployment of IP telephony, wireless, video surveillance, and other solutions by allowing you to send data and power to network endpoints over the single network cable, eliminating the need for separate power supplies or outlets. PoE+ provides up to 30W of power per port, enabling deployments for 802.11ac wireless access points, Pan-Tilt-Zoom (PTZ) IP cameras, videophones, and thin client devices, delivering more flexibility and investment protection. As the IP network addressing scheme evolves to accommodate more devices, you can have peace of mind that your network is ready. Cisco 250 Series switches provide native support for IPv6 alongside traditional IPv4. With USGv6 and IPv6 Gold Logo certifications, the 250 Series will enable you to take full advantage of IPv6-enabled operating systems and applications in the future, without having to upgrade your network equipment.